This Bach Flower Remedy would have brought great relief to a boy I once knew. His every conversation was peppered with the words "I'm sorry." Most of the time, there was nothing to be sorry for, but he apologized anyway. Of course, through the act of constant apology, he irritated those around him - for which he apologized! A person in the negative Pine state may feel guilty over seemingly trivial recent events - he forgot to turn off the oven and burned extra electricity - or by both large and small events from long ago. He may even accept guilt for events that happened long before his birth - even going back to Adam and Eve. He'll also accept the guilt for other's actions. This trait is especially evident in children. The Pine child will become a scapegoat in school, accepting responsibility and guilt for other children's misbehaviour. In the severe Pine state, the individual may apologize for his very existence, perhaps not recognizing that he deserves life, and certainly not recognizing that he deserves to enjoy life. This person asks more from himself than from others, setting high standards that often cannot be met - thus intensifying the guilt. This personality cannot stand up for itself, and feels guilt at asking others to be considerate - such as in asking his neighbour to turn down the stereo or quiet a barking dog. Lacking joy in life, he or she is usually physically tired and worn out. But, when he becomes ill from living in this state, he'll apologize. 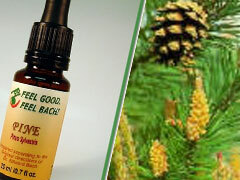 Once treatment with this Bach Flower Essence has been successful, the Pine person is able to see and accept his own faults and mistakes - and let them go, realizing that mistakes are stepping stones in life. Once transformed, the tired and worn out Pine person becomes filled with energy and is able to help others in a similar state - sometimes just by radiating his energy in their presence.